(CNN) -- Two of the biggest stars in the NBA will be team-mates next season after a blockbuster trade which sees Shaquille O'Neal move from the Phoenix Suns to the Cleveland Cavaliers -- the home of league MVP LeBron James. 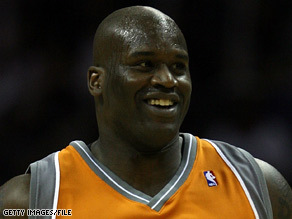 Shaquille O'Neal is hoping his arrival will put a smile on the faces of Cleveland fans. The 37-year-old O'Neal is one of the all-time greats of basketball, winning four NBA championships, three straight with the Los Angeles Lakers and the other with Miami Heat. James is widely recognized as the sport's current superstar, but the 24-year-old has been left frustrated by Cleveland's failure to win the title. He stormed off the court after their loss to the Orlando Magic in the Eastern Conference finals, not even shaking hands with 2008 Olympic teammate Dwight Howard. The trade, which sees Phoenix get center Ben Wallace and guard Sasha Pavlovic, has been talked about since February but finalized on Thursday night. "I was elated about the trade because I get to play with one of the greatest players to ever play the game in LeBron James," O'Neal was quoted on the NBA's official Web site www.nba.com. O'Neal averaged 17.8 points and 8.4 rebounds in 75 games for the Suns last season and believes he still has much to offer the NBA. "My numbers are not good enough to retire. Three more years left," O'Neal wrote on his Twitter blog. His career averages are 24.7 points, 11.3 rebounds and 2.4 blocked shots, with his peak seasons coming as he led the Lakers to three straight titles from 2000-02. The Lakers traded him to Miami where he spent three seasons, helping them to the NBA Championship three years ago. He has played in Phoenix for the past two years, restricted by injuries in his first season. The Cavs, powered by James, won 66 regular season games and their first eight in the playoffs before coming unstuck against the Magic. They will be hoping that O'Neal will be the final piece in the jigsaw to land the first American sports championship for Cleveland in 45 years.